This post will not be funny. In fact, it will not even be fun. But I need to write it. I need to write this, because writing helps me process my own thoughts–and I have a lot of thoughts racing through my mind right now. I need to write this because some day this moment will only be a memory, and I’ll want to remember the details. I need to write this because I need your prayers right now. I need to write this because I know I am not alone in this struggle–and if I can help any of you to feel hope or peace knowing that you are not alone, then it will be worth it. Today was supposed to be a fun day–I would have gotten a popup from the baby tracker app on my phone that told me all about my fetus who would turn 8-weeks today. My baby would be the size of a raspberry and have brain cells growing at the rate of 100 cells per minute. But instead of being 8 weeks closer to meeting our new baby, I am saying goodbye to a baby that will never be. I am in the middle of one of the greatest challenges I’ve ever found myself in: a miscarriage. It’s one of those experiences that I’ve witnessed in others and prayed to never have brought upon myself. And yet, here I am. When Jon and I found out on Christmas Eve that I was pregnant, we were overjoyed. We had been praying for this child for over a year, and it felt like we’d scored the jackpot. It was a Christmas miracle! Since we were in Washington for the holidays, we got to share our happy news with all of our family and closest friends in person. Looking back, I am so grateful that we had that time to share our joy with the people we love them most. For the moment, it seemed, everything was perfect. Unfortunately, our joy was short-lived. Once we returned to California I made an appointment with my doctor to confirm the pregnancy. But during my first routine blood test, a problem quickly became apparent. My pregnancy hormone levels were raising, but not as much nor as quickly as they should be. Over the course of that week I returned to the doctor for half a dozen blood draws, prescription medication, and two ultrasounds. Then, last Friday, January 16th, I got the very diagnosis I’d been dreading: our pregnancy was coming to a close, and there would be no baby to meet at the end of it. The doctor explained to me that I was experiencing something called a blighted ovum or an anembyonic pregnancy. What this means is that a fertilized egg attached itself to the uterine wall, but the embryo never developed. Somewhere in those very early stages of development, something went wrong. My body didn’t know this, though, so it kept preparing to host a new life. The pregnancy sac and the placenta developed, and I experienced the normal side-effects of first-trimester pregnancy. There was no way I could have known what was actually happening inside my body, and there was nothing I could have done to change the outcome. Eventually my body will realize that the baby is no longer developing, and a physical miscarriage is imminent. My doctor gave me the choice of taking medication to initiate this process, or of going in for a medical procedure, or of simply waiting for nature to take its course. I opted to wait for a week to see if things will occur naturally, but when I return to the doctor this Friday we will decide if there are other steps that I want to take. For now, though, I am in that gray area of waiting. Waiting for something I am dreading and mourning. Waiting for the inevitable unhappy ending to my fairytale. It’s horrible, and I am broken. A few days ago I went for a run to try to clear my mind. And as I was out there, alone on the trail, I came upon something that made me stop in my tracks. Right there on the side of the trail was a clump of daffodils, pushing their way out of the soil and proudly blooming in the sunlight. My first thought when I saw the daffodils was that this just wasn’t right. Having lived in cold places all my life, the blooming of daffodils has always been a sign for me of triumph and new beginnings. 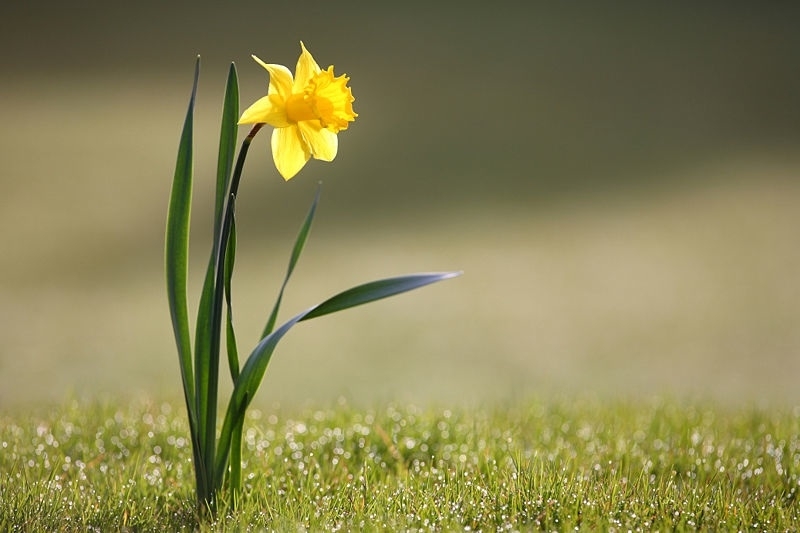 Daffodils come at the end of the darkest season to remind us of the light that is to come. You see, in cold places, there is this season that comes every year called winter. In California we don’t so much get winter as we get a few cool-ish days mixed in with the usual sunshine. Winter in cold places is different. Everything is frozen and dark and bleak. The plants wither away to shriveled twigs and the animals go into hiding. I detest it. And then, just when it seems you’ll never enjoy daylight again, Spring arrives. The sun begins to warm the earth, the animals come out of hibernation, and the plants awaken. The daffodils bloom. I know that the worst is behind us and a new season has begun. So as I was standing there staring at daffodils blooming in the middle of January, I understood something. These lucky California flowers didn’t have to endure the long winter and fight for survival, yet they were still allowed to blossom and grow. They were experiencing undeserved grace, getting something wonderful even though they’d done nothing to deserve it. And you know what? I am experiencing that same grace, even in the midst of this darkest hour. Every time I hug and kiss and snuggle the two sons I already have, that is grace. Every time my husband encourages me or lets me cry on his shoulder, that is grace. Every time a friend calls or texts or sends me an email to let me know they are praying for me, that is grace. Every time I find joy in the midst of pain, that is grace. Every time the sun rises on a new day, that is grace. Every time I am reminded of where my hope lies–not in the fleeting conditions of this world, but in my eternal salvation through Jesus–that is grace. So that is the grace I am holding close to my heart today. Even though all I see right now is a disaster, God has a plan. He has a plan for me and my family and our baby who He’s already called Home. He has plans to pull me out of my despair and allow me to flourish again. This ordeal is not meant to harm me, but to grow me in new and challenging ways. He reminds me that my hope has simply been deferred, not abandoned–and that my hope in His Truth has been strengthened. He promises me a future. This is not the end of my story. And just like the daffodils, I will bloom again some day. But first, I have to get through the long, dark days of winter. I will survive, and I will live to see the light of a new beginning. By God’s grace, I will triumph. These last few weeks have been marvelous. Over Christmas break I got to spend two whole weeks at my parents’ house relaxing and enjoying the holiday festivities. I got to spend two whole weeks eating other peoples’ food that other people cooked and that other people cleaned up after. Two whole weeks of allowing others to do the vacuuming and the toilet scrubbing and the taking-out-the-garbage. It was…extraordinary. Between not-cooking and not-cleaning I found myself with a rare gift: down time. And, since I was on vacation, I decided to use my new-found downtime in the most productive way I could think of: mindlessly perusing the internet. Well, wouldn’t you know it! I was thinking of buying that exact same strapless sequined number to wear for preschool drop off! That sparkly clutch would probably hold a credit card AND a diaper! And those shoes! They’d be perfect for Costco runs and trips to the pediatrician! OK, not really. While my clothing will probably never grace to pages of Glamour Magazine (heck, I don’t think my clothes even know what Glamour Magazine is), I’ve still got style. My style. The style of a busy stay-at-home mom who chooses comfort over fashion. And yet, the #ootd phenomenon has inspired me. I think I will join the ranks of fashion bloggers and give you, dear friends, a highly anticipated glance into my wardrobe. I now present to you: Allison’s #ootd. I know you’re getting jealous of my unique sense of style and incredible eye for fashion, but I have just a few more gems for you. Outfit deets: tank–Tesco (an Irish grocery store. Yes, the grocery stores there sell clothes. ); cardi–Target (basically an American grocery store that sells clothes); shoes–Toms (because I like giving shoes to people in need). This outfit is awesome because it’s layered (a practice that is apparently quite en vogue). If I get too warm, I can do the oh-so-fashionable tie-the-sweater-around-my-waist trick. I didn’t even wear this outfit this week, but I just wanted to show you that I do own clothes that are not yoga pants and jeans. Outfit deets: dress–Old Navy; belt–Debenham’s (Irish Macy’s); necklace–LivingSocial deal (I have no idea what company actually made it, but I love it. Unfortuantely the beads have started to come loose and I keep reattaching them to the necklace haphazardly. I guess the interesting shape just gives it more character); shoes–H&M. Day 7–A Super Boy Bonus Feature! David saw me modeling my wardrobe and he wanted to show off his duds, too. Here he is in his #ootd: an outfit he put on while he was playing at the neighbors house. Since all of the clothes belong to another child, I’m not sure where you might find these incredible pieces. If you do borrow clothing from the neighbor girl, however, I suggest you borrow a skin-tight midriff-exposing shirt and pants that you wear low enough on your waist to expose a band of blue undies. Suuuuuper cute. I hope I’ve offered you some wardrobe inspiration with my outfit of the day picks. And, when in doubt, just put on yoga pants. Comfort will never lead you wrong!